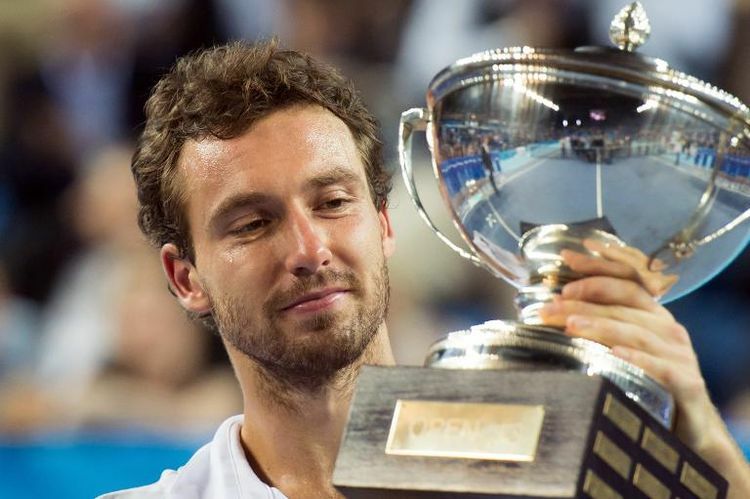 It is a strange quirk that Ernests Gulbis, that least reliable of professional tennis players, somehow boasts a perfect record in tour finals, a record he kept intact today in Marseille. He has now won five ATP titles without losing one, a kind of scruffy yin to so many proven yangs, such as Gael Monfils or Julien Benneteau. Gulbis didn’t get to play either Monfils or Benneteau this week, though that wasn’t his fault, since the former wasn’t here and the latter was defeated early on in another part of the draw. As the truism goes, you don’t get to choose which Frenchmen you face in tennis. You can only defeat the ones who are placed in front of you. It was, fittingly, a non-Frenchman Gulbis struggled with. His toughest test came against Roberto Bautista Agut in the second round, although this wasn’t strictly a surprise. (The surprise was that having eluded defeat the Latvian went on winning.) Bautista Agut has distinguished himself this season with several scrapping, aggressive and defiant efforts, though this week he also distinguished himself by being just about the only Spanish man with a tennis racquet not playing in Rio. Consider this: there were more Spaniards in Rafael Nadal’s half of the Rio draw than there were Frenchmen in the entire Marseille draw. Once Gulbis had survived that early round struggle, he set about beating any locals he could lay his hands on, starting with Nicolas Mahut, continuing with Richard Gasquet and concluding today with Jo-Wilfried Tsonga. It wasn’t a particularly exciting final as these things are measured, and certainly not compared to last year’s decider between Tsonga and Tomas Berdych. As you’d imagine when two big men face each other on a fast indoor court, the service dominated, though better returning would have helped it dominate less. Gulbis had not been broken since the second round, and Tsonga today could engineer only two opportunities, which he characteristically flubbed. Gulbis on the other hand was in plenty of the Frenchman’s service games, although he was no more effective at converting break points, ending the match with a rather memorable 1/11. The Frenchman generally saved them with muscular play, and managed to do the same with a few match points in the second tiebreak. Gulbis served it out with an ace, before commencing a victory routine from which he’d carefully expunged any trace of exaltation. It made Marat Safin’s celebrations look flamboyant by comparison. You’d think Gulbis wins these things every other week. Actually, that’s not far off. He usually wins these things in this week every other year. Last year he won Delray Beach as a qualifier, and his maiden title came at that tournament in 2010. It may seem surprising that he hasn’t returned to Florida this year, but his failure to show up for title defences is another of the few infuriatingly consistent things about him. So far in his career he has never once graced a tournament the year after he has won it. Look for him in Rio next year, or at least anywhere but Marseille. Owing to a minor calendar shake-up, Nadal will next week find himself in the rare position of having two titles to defend, in Acapulco and Sao Paulo. Taking a leaf from Gulbis’ playbook, he has chosen to skip both, preferring instead to win this week’s inaugural Rio event. After all, opportunities to be the first name on a new trophy don’t come round every week, presuming there’s a trophy upon which names can be inscribed. Nadal almost surprised us all by not winning the tournament, though got there in the end. The direst moment came against Pablo Andujar in the semifinal, a match that saw the world number one recover from a set down, and finally take it in a mighty third set tiebreak, saving a pair of match points along the way. For once the bromidic phrase ‘he found a way to win’, usually uttered at the first faint whiff of adversity, was actually merited. Usually the way he finds entails being better at tennis than his opponent, but against an inspired Andujar there were stretches of the match in which Nadal was emphatically outplayed. Indeed, Andujar won more points overall. Alas for him, he lacked either the savagery or the cold precision necessary to claim the points that mattered most. He has thus been relegated to a statistical anomaly – this was the first time Nadal has won from match point down since beating Troicki in Tokyo in 2010. Alex Dolgopolov’s half of the Rio draw had, for a wonder, boasted only two Spaniards, but they were two of the toughest in David Ferrer and Nicolas Almagro, although the latter has lately learned to be as disappointing on South American clay as he perennially is on the European variety. Throw in Fabio Fognini, and plenty of reasons to be distracted by events back home, and Dolgopolov’s run to the Rio final proved to be a minor masterpiece of tightrope-sprinting. He’d been marvellous, in his dicey weird way. I wouldn’t go so far as to say that there’s no better player to watch when he’s on. Indeed, to say that would be to confess to fetishism. He has a game only a mother could love, but there’s no denying the excitement he delivers, especially for those of us drawn to unpredictable, aggressive tennis. Regardless, the betting markets, history and the general opinion of the person on the street were unanimous in believing that it wouldn’t be enough to get by Nadal in the final. The only exceptions were those subsets of Nadal fandom which insisted that Nadal’s flat performance against Andujar would be sustained into the final: a passionately misguided belief in Nadal’s frangibility has meant some fans fail to absorb the lesson that he very rarely plays badly, and almost never plays badly twice in a row. As ever with Dolgopolov the interest lay in discovering whether the strobes of brilliance could be spaced with sufficient proximity so as to provide consistent luminescence. So far this week they had. His only real chance for the final, however, was to hope they joined up to form a band of light so incandescent it might sear the retinas from Nadal’s head. Dolgopolov lacks anything resembling a bread-and-butter game. Whether through technique or temperament, he appears incapable of sustaining discernible, or at any rate reliable, patterns of play. He is hell to play when he’s playing well. The trick, as far as I can tell, is to force him to have to play well or else, thus ensuring that he probably won’t. Nadal, as ever, had the luxury of being able to achieve this by deploying any number of established patterns, knowing that most if not all of these would likely guarantee him victory. Today’s patterns involved nothing fancier than the judicious application of just enough pressure to provoke Dolgopolov into over-hitting. This was particularly apparent in the first set, in which Nadal himself hit only one winner, which was the ace he served to seal it. The Spaniard broke early in the second set (as he had in the first), and looked likely to coast it out. Dolgopolov, after all, had not broken Nadal, not merely in this match, but in any of the four other matches they’ve contested. It therefore came as something of a surprise when an apparently nervous Nadal lost his way while trying to serve it out at 5/4, the break sealed with yet another scything Dolgopolov crosscourt backhand into the top seed’s forehand corner. I recall how effective this tactic was for Troicki in Tokyo three years ago, thus providing a lesson that Novak Djokovic subsequently learned by rote. You can go crosscourt to Nadal’s forehand, but you have to take the ball very early, and go there flat and with tremendous pace. Dolgopolov went there time and again today with great success, but it’s a dicey way to live, especially on clay, where Nadal is inexorable. He was certainly inexorable in the eventual tiebreak, and Dolgopolov’s proved all over again that risky tennis only looks good when it comes off. The flashes of light were now spaced too far apart, and soon they went out entirely. Nadal won’t be the last Rio champion, but he’ll always be the first. The trophy, worthy of a European indoor event in its determination to reference anything but a trophy, was handed over by the universally beloved Gustavo Kuerten. It’s a kind of lattice-worked wave arrangement, and thus provided plenty of spots for Nadal’s teeth to find purchase. (Marseille, ironically, has a perfectly ordinary trophy, which Gulbis did not bite.) Both men brought up Ukraine’s current situation in their speeches, Nadal graciously and Dolgopolov with all his heart. To say that Wawrinka was a little lucky is a little redundant. No one wins a Major without some luck, least of all those who aren’t lucky enough to be Roger Federer, Nadal, Novak Djokovic or Andy Murray, collectively known as the big four. Since the 2004 French Open, only three men besides those four have contrived to win a Major – a sequence of thirty-nine tournaments – and in no case was the eventual winner permitted to amble through a wide open draw. At the 2005 Australian Open Marat Safin defeated the first (Federer) and third (Hewitt) seeds. At the 2009 US Open, Juan Martin del Potro also beat the first (Federer) and third (Nadal) seeds. Wawrinka is the first man to see off the first (Nadal) and second (Djokovic) seeds to win a Major since Sergi Bruguera at the 1993 French Open. Boris Becker insisted when probed that he would never concede any side of a draw is easier than the other, but then the words that tumble out of Becker’s mouth often bear no trace of a supervising intellect. Perhaps they should have probed him more thoroughly, or with a sharper implement. Wawrinka’s half of the draw was certainly friendlier than the other half, and he was unquestionably helped by a retirement in the first round (Golubev) and a walkover in the third (Pospisil), especially since it limited his exposure to the apocalyptic conditions of the first week. But that merely helped him survive the early rounds, and no draw is benign that brings one up against Djokovic, especially in Melbourne. From the quarterfinal until the second set of the final, when events lurched into a strange place, Wawrinka was mostly majestic. As he did with Robin Soderling, Magnus Norman has performed wonders with Wawrinka, and in a relatively short time has ensconced himself among the coaching elite. Unfortunately, even Norman hadn’t anticipated the sharp dip the final would take – a slow turn through the S-bend – and thus couldn’t have known to prepare his charge accordingly. Perhaps he’d figured that the concept of hitting the ball away from an immobile opponent was too obvious to need saying. It turns out nothing is too obvious in a Slam final. It might have been worth a professional code violation to belatedly deliver this complicated message. Marching onto court and smacking Wawrinka upside the head probably would have risked a default, but Norman must have been sorely tempted. I know I was. I suspect even Nadal was by the end. Nadal’s back injury inevitably obliges one to wonder what might have transpired had he remained fit, though I confess I don’t find such speculation worthwhile. There was one set in which both players looked fine, and Wawrinka dominated it, but this was his first Major final and there is little reason to think he could have sustained that level indefinitely. One suspects Nadal eventually would have pegged him back. In any case, Nadal’s injuries are a misted, shifting quagmire in which even well-provisioned expeditions are liable to be waylaid and careen over a precipice. Mountains spring from molehills, or at any rate, blisters become volcanoes. Writers who toil hard to maintain a veil of impartiality can fall to anxious weeping the moment Nadal stumbles. There was a moment when he might have twisted his ankle against Kei Nishikori. It soon turned out that he hadn’t, though not soon enough for some alleged professionals to demonstrate that there are in fact fifty-four stages of grief, and that they’re all boring. By the same token, those insisting that Nadal was not injured are certainly wrong, and in many cases have taken their insistence to contemptible lengths. They are also beyond convincing, being possessed by a special kind of mania. As I say, a quagmire, and not worth the trouble. Others have insisted they noticed something awry with Nadal early in the first set, if not in the hit-up. Perhaps I’m obtuse, or I was busy staring awestruck at the fearless guy up the other end, but I confess I didn’t see anything wrong. I did remark to my companions that Nadal appeared to have fallen into the trap he used to with David Nalbandian, which was to pay a famous backhand too much respect. Wawrinka’s backhand is, without doubt, a superb shot, one by which I am often reduced to envy. But his forehand remains the more potent shot, and it’s from that wing that most of his groundstroke winners originate. The semifinal was an especially fine showcase for this. Tomas Berdych heard countless forehands hum past. I suppose it hardly mattered, Wawrinka was fearsome from both sides through the first set. It’s worth remembering that this was the first set he ever took from Nadal, though he nearly didn’t. He fell down 0-40 while serving for it, halfway through a sequence of six missed first serves. Nadal then failed to put another second serve return into play, and it’s easy enough to believe his later claim that his back was already bothering him. Something was wrong somewhere. 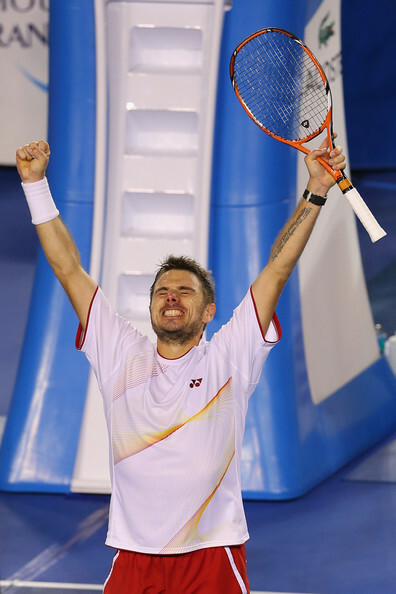 The matched changed completely in the second set, which Wawrinka opened in grand fashion by breaking to love. It wasn’t long after this that Nadal evinced clear signs of distress, leaning over and clutching his back, and at 1/2 availed himself of a long off-court medical timeout. Wawrinka, left in the dark on the bright court, took his frustration out on Carlos Ramos, and was only slightly mollified when tournament referee Wayne McKewan emerged with an explanation. There was some concern that the Swiss was thereby squandering valuable energy. Magnus Norman looked on serenely. Nadal re-emerged, encountering lusty boos from the Rod Laver Arena crowd, behaviour that what won’t go down as its finest. (Nadal later said he understood their frustration, though unlike Bernard Tomic he didn’t call a separate press conference to explain himself.) Nadal’s face looked exactly the way it had in the 2011 Australian Open quarterfinal, when an injury early in the first set combined with a ruthless David Ferrer to destroy his chance at the ‘Rafa Slam’. Wawrinka worked out his vestigial frustration with a brace of aces, while Nadal commenced lobbing serves over at about 140kmh. Before long Wawrinka had won his second set against Nadal. There was speculation that Nadal would default. I didn’t think he would, but believed that the match was essentially over, assuming Wawrinka would do the smart thing and make the Spaniard run. This turned out to be a rather large assumption to make. Although physicists have yet to isolate the mechanism by which this process works, injured players will sometimes transform into a kind of localised gravity-well, drawing every ball inexorably towards them. The only reliable way for the opponent to avoid this effect is to launch their shots ten feet out. For the next set and a half Wawrinka tried both these approaches, with limited success. It recalled Albert Montanes’ flailing and dispiriting loss to a crippled Fabio Fognini at Roland Garros three years ago, and Mikhail Kukushkin’s near-implosion against Gael Monfils at the Australian Open. In both cases the latter player could barely move, and was reduced to windmilling his arms at any ball that strayed within reach, generally to devastating effect. In much the same mood, Nadal hardly bothered running for any ball more than a few metres away, but swung lustily at any that landed nearby, which, somehow, was nearly all of them. Thus we discovered yet again that the world number one in a reckless mood is perfectly capable of striking fabulous winners off both sides from neutral balls, leaving some of us to wish that he’d play like this more often. Nadal still missed plenty, however, enabling Wawrinka to achieve multiple breakpoints in every other game, whereupon Wawrinka’s return would explore the bottom of the net or the unscuffed part of the court beyond the Melbourne sign. Nadal’s pace and mobility began gradually to improve, and he won the third set. 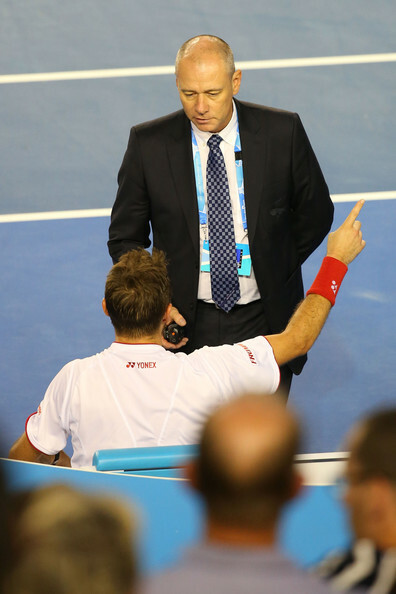 Wawrinka took to shouting at himself, but not in English. Magnus Norman looked on serenely. A match that began electrifyingly for Wawrinka, and continued dismally for Nadal, now spiralled into absurdity for both. Nadal, by his own admission, was mainly continuing for the fans who’d paid a lot of money to be there, but he must have wondered if he wouldn’t be doing them a kindness to end it immediately. Then again, I imagine by this time he was harbouring a few desperate dreams of victory. Aside from his first serve, which Wawrinka could barely return anyway, the Spaniard was starting to play a great deal better. On the other hand, Wawrinka, aside from his serve, had lost all coherence, and his eyes grew clouded with dread. The 2004 French Open final was invoked – always a sure sign that the ropes binding reality together had begun to fray. Jim Courier in commentary pointed out, astutely, that Wawrinka could have lost the final in straight sets and still regarded the tournament as a triumph, but to lose it from this point would be a fiasco. Wawrinka was playing like someone aware of no other fact. He somehow broke, but followed up this accomplishment, monumental in the circumstances, with the worst service game of the modern era, and lost his serve to love. He broke again, more decisively. The crowd went crazy – demented might be a better word – having stared once too often into the abyss. Wawrinka served it out to love, the way exactly no one assumed he would. In deference to his wounded opponent, his celebration was diffident. Magnus Norman leapt to his feet, exultant, and threw his arms around Severin Luthi. Nadal had been granted an unlooked-for hour on court to come to terms with the near-certainty of defeat, but he still looked quite stricken, a look he retained throughout the trophy ceremony. Thomas Oh, Kia Motor’s ineffable representative, was so moved by what he’d seen that he kept his speech down to a few minutes, instead of its usual hour. Both players spoke well, though their efforts hardly compared to Li Na’s masterpiece from the night before. Where before they’d booed him, the RLA crowd now hurled their adoration down on Nadal, who fought to quell his tears but lost. Pete Sampras was on hand to dole out the silverware. The official reason for this was because it is the twentieth anniversary of his first Australian Open title. No one failed to grasp the deeper significance, however, which was that, had Nadal won, the world number one would have equalled the American’s Major tally of fourteen. It brought to mind the 2009 final, in which Federer failed to win his expected fourteenth Major. We were in turn reminded that the French Open is only months away. I doubt whether anyone believes Nadal won’t surpass Sampras before long. For now, however, the important number isn’t fourteen, but one. 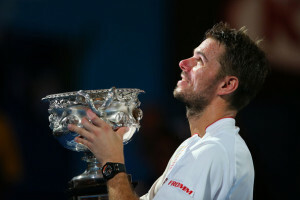 Stan Wawrinka, who at some point regressed down the evolutionary chain from being ‘Stan the Man’ to become the ‘Stanimal’, has won his first Major, and has earned his place among the sport’s elite. I, too, feel kind of speechless saying that. The first week of the 2014 Australian Open was feverishly warm, generating liquid quick conditions that caused results to flow in all directions, and ensuring that reporters who’d spent too little of their off-season toiling on Agassi’s magic mountain could remain an appropriately high simmer. The cool change that swept through Melbourne late on Friday night wrought a dramatic change, bringing kinder conditions, an abrupt lessening in the number of self-righteous articles about the tournament’s heat policy, and the return of Lleyton Hewitt to the Channel 7 commentary booth. On balance, I declare it a net positive. Hewitt took longer than usual to turn up. Usually he turns up after a couple of days spent processing his latest early-round loss, but this year he tarried for almost a week. It’s conceivable he got lost, since Channel 7’s commentary booth has been relocated, and renamed. The previous iteration was known as the ‘bunker’, and consisted of a low wooden structure placed out on the court surface, just to the side of the entrance tunnel. It was cunningly painted the same blue as the surface, yet somehow failed to blend in, probably because it was still a shack on a tennis court. The new arrangement is more traditional, consisting of a booth partly recessed behind the back of the court, permitting commentators an unparalleled view of the linesman’s buttocks. The voices emanating from within this enclosure, you’ll be relieved to hear, have not changed. Channel 7’s commentary remains a special brand of magnificent. Scornful of Tommy Robredo’s remote court positioning, Jim Courier remarked with a tone of faux-wonder that the Spaniard ‘was intentionally giving up geometry’. I once gave up physics for an afternoon, and can attest to the risks involved. Courier of course hails from a culture in which the right to maintain geometry is constitutionally enshrined, in which lunatic lobby groups famously insist that their beloved set-squares and protractors will have to be pried from their cold dead hands. Having forsaken geometry, Robredo lost to a rampant Stan Wawrinka, whom Channel 7 has cruelly nicknamed ‘The Stanimal’. Robredo mastered the heat for a while, but he’s cold news now. Hewitt’s return was accompanied by a sharp upswing in the use of the word ‘tremendous’ and the phrase ‘extremely well’. He can be an ornery character on court, but in commentary his contribution is invariably positive. Marvelling at Roger Federer’s continued excellence, he took care to highlight ‘the self-belief he has, not only in himself, but in his racquet as well.’ High praise, indeed. Bruce McAveny, famously so thorough in his research, persists in pronouncing David Ferrer as David Fer-ur, as in ‘urn’. He’s either incorrect, or knows something the rest of us don’t, including David Fer-ur. It is generally the case that the narratives which consume the first week of a Major burn out by the second. Wimbledon has a rest day on its middle Sunday to ensure the break is literal, while the US Open starts to crank up its trusty hurricane machine, affectionately known as ‘Bessie’. The first week of this year’s Australian Open was clangourous with sound and fury, but ultimately it signified little. There were intriguing upsets, and new stars, fistfuls of retirements and Ivan Dodig’s assertion that he thought he would die (no article attacking the tournament organisers failed to include Dodig’s expert self-diagnosis, although they were reluctant to point out that he demonstrably did not die, and two days later won a doubles match). There was Tomic dragging down the host nation’s spirits, and Kyrgios and Kokkinakis to buoy them up again. Damir Dzumhur was the first Bosnian man to enter any main draw. Donald Young was the last American man to leave this particular main draw. Philipp Kohlschreiber’s withdrawal from the main draw provided an opening for Stephane Robert. He entered the main draw as a Lucky Loser, but left it as a kind of folk hero, and spent long minutes after his defeat to Andy Murray absorbing the admiration of the Hisense crowd. Indeed, the Hisense crowd itself deserves a mention, since it is entirely a first week phenomenon. While it lasts, no crowd at Melbourne Park cheers louder and longer, its appreciation fuelled by a heartfelt sense of gratitude whenever a truly big name drops by. A ticket to Rod Laver Arena rarely represents a smart investment in the first week, unless you’re eager to witness elite players mete out rough justice on journeymen. You can watch the same spectacle on Hisense for considerably less money, but as often you’ll see a close match, or even an upset. Mostly, however, a simple grounds pass is all the average punter requires, especially in the early rounds. Holders of such tickets were privileged to watch Roberto Bautista-Agut tear through the draw, until he was halted yesterday by Grigor Dimitrov. Those same fans, or ones like them, were permitted to enjoy Dimitrov’s sterling victory over Milos Raonic the round before. Aided by cooler conditions, the fourth round admirably served its intended purpose of bringing the hothouse lunacy to an abrupt halt, freezing in place a draw that had threatened perpetually to burst apart. Whereas early on men who knew no better conducted marathon contests in gruelling heat, no match in the fourth round lasted five sets, and few reached four. Players like Robert and Bautista-Agut set the first week alight, but none of them survived the round of sixteen. Indeed, for just the second time in the Open Era, the Australian Open men’s quarterfinals are comprised by seven of the eight top seeds. 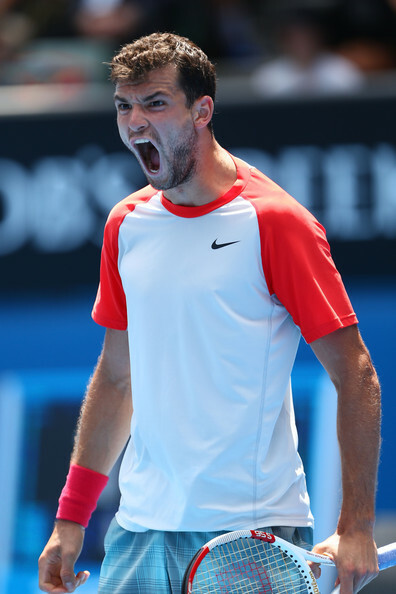 The sole exception is Dimitrov, the twenty-second seed, who gambolled through Juan Martin del Potro’s vacant section. His gambolling days might well be done, however: he next faces Rafael Nadal, whose first week was mainly remarkable for how extravagantly its difficulty was overestimated by his fans. Tomic naturally helped matters by retiring wounded after a set, as did Gael Monfils by playing one of the least tactically astute matches imaginable; of all the dense particles in this year’s draw, Monfils was arguably the densest. Nadal’s sternest test came in the unlikely form of Kei Nishikori, who arrived equipped with a precise template of how to play the world number one, which was to never permit the Spaniard a forehand unless he was stretched or surprised. Nishikori’s eventual loss was as gallant and honourable as a straight sets loss can be, and an indirect rebuke to all those who’ve prematurely given up. 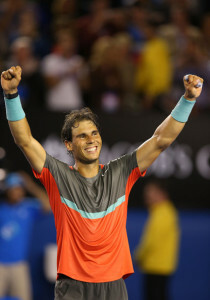 Nadal’s victory was a testament to the fact that he is quite a lot better at tennis than his opponent. A good player can play him exactly the right way and still not win a set. Yesterday he was pressed, but always came up with precisely the right shot when it mattered, and closed the match with, of all things, a dominant serving display. Kevin Anderson, for his sins, was obliged to face Tomas Berdych yet again. Two years ago they had never faced each other. Perhaps they’d never even met socially. They’ve now played ten times, and Anderson is yet to win. Sunday’s loss was among the most comprehensive. Berdych was superb, and has reached the quarterfinals of this tournament for the fourth straight year, this time without dropping serve. In previous quarterfinals he faced Djokovic twice and Nadal once, and lost each time. This year he’ll face Ferrer, a far more benign prospect. Ferrer’s quarter was weak to begin with, and only grew weaker as the rounds melted away. Berdych will be his first legitimate test. Channel 7’s helpful ‘Things You May Not Know’ box told us that Berdych has dated Lucie Safarova since 2011. The most eagerly anticipated fourth round match was between Jo-Wilfried Tsonga and Federer, which Channel 7, tireless in pursuit of an angle, billed as a grudge match. Their logic, to use the term generously, was that Federer defeated Tsonga in five sets here last year, though you’d imagine Tsonga’s straight sets dismissal of the Swiss at Roland Garros eased his pain somewhat. Whatever the case, Federer repaid the treatment last night, inflicting a comprehensive shellacking that one could term clinical, depending on the clinic. I’m partial to Tsonga, and had thus hoped for more, but Federer in this form – torrents of winners and enterprising net play – is as hard to begrudge as he was hard to gainsay. There were, as Robbie Koenig would say, innumerable oil painting forehands. Indeed, it was an oil painting of a match, and Tsonga shouldn’t be disparaged because he seemed resigned merely to stretch the canvas. He made too little of the few chances he had, but it wasn’t really his fault that those chances seldom came round. Undoubtedly Murray will create more chances in the next round, but it’s pointless to blame Tsonga for not being Murray. The Frenchman surged to life late in the third set, saving three break points in a manner that only he can, but alas it was too late. Federer was unstoppable by this time, brimming with self-belief for himself, at one with his vintage game, and his brand new frame. 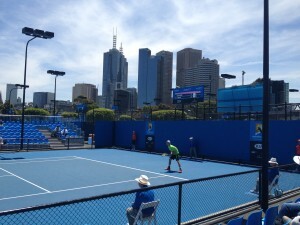 The persistent theme through the first three days of the 2014 Australian Open was heat, evident in the desperate struggles of all players to complete their assigned matches, and the even mightier struggle of the attendant press corps to come up with more evocative descriptions for the conditions than ‘brutal’ and ‘searing’. Mercifully Bernard Tomic was on hand, permitting the assembled hacks to deploy other cherished adjectives such as ‘un-Australian’ and ‘disappointing’. So far ten matches have concluded in retirement, including nine in the first round, which equalled the record set at the US Open in 2011. Unfortunately for the prevailing narrative, few of the retirements occurred due to the heat, the brutality of which has, to be sure, been searing. Ivan Dodig is probably the only one: today he retired from cramps against Damir Dzumhur while leading two sets to one, and afterwards proposed a revised schedule for the tournament, which shockingly didn’t set aside its existing protocols on the suggestion of one ailing journeyman. Dzumhur may well have voiced similar complaints, but they were drowned out by his Bosnian supporters, who’d earlier celebrated each won game with closely harmonised chanting, and his lone victorious set with a passionate accordion solo. Frank Dancevic yesterday passed out from heat stroke, but soon came round, although not round far enough to elude imminent defeat. It was worth pushing on, however; if anyone could manage to lose from two sets up to a semi-comatose opponent, Benoit Paire is the one. The most widely anticipated match of the first round was between Tomic and Rafael Nadal, or as Channel 7 billed it, a showdown between the world’s best twenty-one year old and the world’s best player. Would Tomic’s first round record remain intact, they demanded breathlessly. (The Australian, you see, had never lost in the first round in Melbourne, which is commendable, but largely speaks to his good fortune. He has never run afoul of a truly elite player first up, unlike, say, Ryan Harrison, who lost handily yesterday to Gael Monfils.) As it happened, Tomic pulled out after a reasonable first set, instantly transforming it into the most disappointing match of the round, and damning himself for eternity. He ill-deserved the opprobrium the Rod Laver Arena crowd flung his way, or perhaps he did deserve it, but not for judiciously retiring with a legitimate and pre-existing injury. The crowd probably just hoped for a better spectacle, or at any rate a longer one. Nadal looked suitably crestfallen that he wouldn’t have to spend a few more hours toiling in the apocalyptic heat. 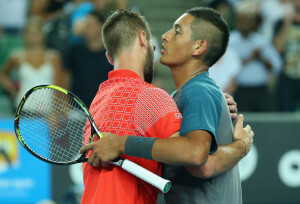 Tomic’s retirement brought to a close a sorry yesterday for the locals on Rod Laver Arena, the dramatic centrepiece of which was Lleyton Hewitt’s five-set defeat to Andreas Seppi. Being Hewitt, it unfolded almost exactly how you’d expect it to: a stirring scrabble out of a two set pit, a recovered break in each of the last three sets, a match point on the Italian’s serve, saved, then a weak late game to be broken. Hewitt has lately enjoyed his finest form for half a decade, yet in the tournament that matters most he still managed to eke out a heroic loss more or less indistinguishable from all the others. 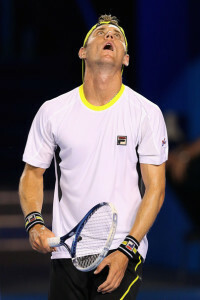 Seppi, however, deserved nothing less than victory, especially given his execrable recent form. His reward is a soft second round against Donald Young, who progressed when Haase retired. Earlier Roger Federer wasted neither energy nor time beating James Duckworth, though he took a while to work out why Duckworth kept serving from the doubles alley. There was undoubtedly a plan, but it was a bad plan. There’ll come a day when Nick Kyrgios and Thanasi Kokkinakis aren’t mentioned in the same breath, but, as Aragorn reminds us, it is not this day. Scheduled consecutively on Court 3, both teenagers assembled tremendous four set victories against experienced professionals in Benjamin Becker and Igor Sijsling respectively. Channel 7 immediately anointed them ‘Greek gods in the making’. Tomorrow the younger of the Greek gods, Kokkinakis, gets to face Nadal in the savage immensity of mid-afternoon. Whatever happens, you can bet he won’t retire. Not if he knows what’s good for him. If he wins a set, he’ll be fast-tracked into the Pantheon. On Monday Matt Ebden expertly manoeuvred himself into a two set lead, a position in which he often finds himself in the Australian Open’s first round, invariably as a prelude to losing in five. He lost the next two sets, as per the script, but then startled everyone by comprehensively outplaying Nicolas Mahut in the fifth. The heat was already apocalyptic, but this portended doom. As I write Ebden is headlining the least thrilling prime time line up on Rod Laver Arena in living memory – in keeping with the tournament’s policy to limit the viewing public’s exposure to David Ferrer – although the kinds of Australians who use the term ‘un-Australian’ without blushing in shame are no doubt thrilled. Perhaps they’d be even more thrilled to discover that the regular season affords many more opportunities to watch Ebden. They were probably less pleased by the result, which was that their man contrived somehow to lose to Vasek Pospisil, who for extended periods in the match could barely move. It only gradually dawned on the commentators that Ebden wouldn’t win by default, and even longer to sink in that he might not win at all. In the end his defeat was a testament to his incapacity to seize an opportunity that had been carefully affixed to his hands with industrial adhesive, a monument to tactical ineptitude. But no one has ever been called un-Australian for playing a stupid match, and Pospisil, who ignored every opportunity to quit, showed us that no match is truly unwinnable. † The Herald Sun enjoys the highest circulation of any newspaper in Australia, providing a useful corrective to the view that Australia is some kind of journalism nirvana. 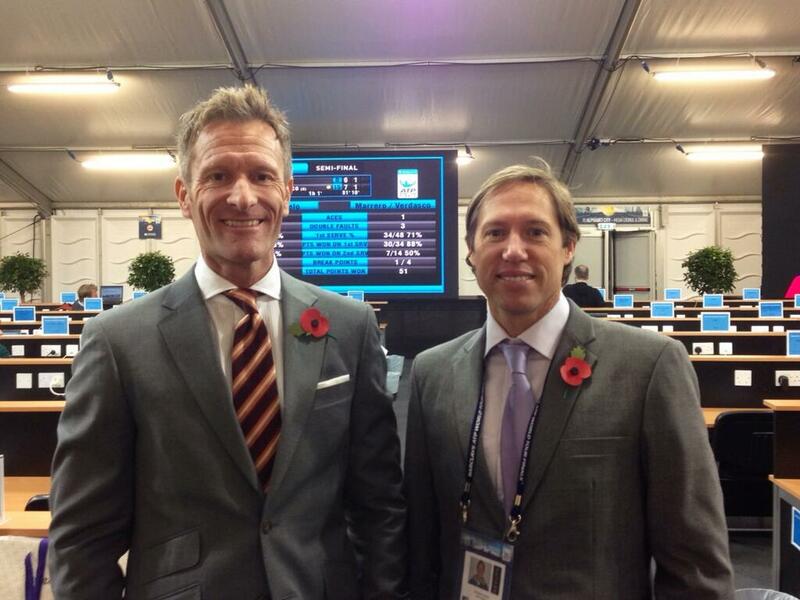 Their tennis correspondent is Leo Schlink. This sentence is representative of his usual standard: ‘Invaiarably, Bernie Tomic is regarded lowly by many.’ You can correct the typo, but nothing short of amputation will fix a tin ear. The professional tennis season seems to commence earlier every year, which is to say, less late in the previous year. Eight elite men endorsed by the International Management Group were already darting through Abu Dhabi’s liquid air while the less athletically ambitious among us still metabolised our lazy Christmas feasts. I assume someone won the Mubadala World Tennis Championship, though I wouldn’t be surprised to hear the whole thing evaporated in a haze of irrelevance.† It was over before I knew it, and certainly before I bothered to tuned in. I’d barely begun searching for chocolate in the unopened panels of my children’s advent calendars before meaningful play was under way in Chennai, Doha and Brisbane. For many Australians, Christmas represents merely the most concentrated expression of the perennial fantasy that we are a small, cold county in the United Kingdom, and not a hot, dry continent located in the southern Pacific Ocean. A disembodied and dislocated Bing Crosby extols the benefits of a white Christmas in every department store. Vast artificial pine trees, festooned with yuletide bling, conveniently obstruct shopper’s views of the outside world, where eucalypts sag in the heat, sap dribbling away. School children are organised into ad hoc choirs, forced to pipe movingly about an unexplained feast (Stephen) where a king they’ve never heard of (Wenceslas) slogs through a substance they’ve never touched (snow). (There is only one well-known Australian Christmas ‘carol’ – well-known in Australia, that is – called Six White Boomers, which rousingly recounts that famous occasion when Santa’s reindeer were replaced by half a dozen kangaroos.) Trapped by December’s dull immensity and two centuries of cultural inertia, we gorge on imported turkey, hide superseded currency in hot puddings, and bunt our homes in tinsel. The best times, the ones that unite the nation, come when we beat the English at cricket. Sport is one of the few areas where Australia’s strident declarations of global relevance don’t mask crippling insecurity. This is not to imply the sporting declarations aren’t bombastic and delusional, merely that they aren’t born from the cringing assumption that everyone else does everything better. As a nation we legitimately believe that we should win at any sport we turn our hand to, excepting those events conducted on ice or snow, and possibly gymnastics. That we aren’t dominating baseball or hurling merely speaks to the fact that we haven’t got around to them yet. It also means that the sporting public can be slow to cotton on if our dominance wanes. When our swim team doesn’t win all the gold medals, we launch exhaustive reviews to uncover structural flaws, barely pausing to consider that we might just lack the best swimmers. As I write the Australian cricket team is seeking to complete a 5-0 series demolition of England’s cricket team, which I won’t deny has been a treat to watch. Before the current series, however, Australia had barely won an international cricket match all year, and hadn’t beaten England in a Test series since 2007. Australia at present is far from the best cricket team in the world, but for a very long time it knew no peer. Given the substantial lag-time between events occurring and their significance penetrating the general consciousness, recent poor results were treated as an aberration rather than the new norm. Thus the current resurgence hasn’t been greeted with relief so much as satisfaction at the resumption of normal service. Meanwhile the English press, long-inured to abject losses, have found their best fears confirmed, thus enabling their favourite pastime, which is excoriating their cricketers. Cultures of victory and defeat originate in reality, but they always leave it behind. It’s much the same with tennis. Those who know only a little still assume Roger Federer will win every tournament he enters. Certainly the good burghers attending the Brisbane International aren’t discouraged in this assumption, nor are television viewers. Vision of him cradling koalas and promos for his upcoming charity night fills whatever space is left over once the commentators finish extolling the local talent. To be fair, there’s no good reason to think Federer won’t win it. The draw wasn’t strong even when it was still intact, and it broke apart almost immediately. He has reached the semifinals by defeating Jarkko Nieminen and Marinko Matosevic without any discernible effort, though Matosevic looked like collapsing by the end of the second set, after less than an hour on court. Nor has Federer’s new, larger Wilson frame caused a problem. His serve has regained its erstwhile effectiveness – last year it proved a useful barometer of the state of his back – while the famed forehand, John Fitzgerald reassures us, still boasts ‘plenty of trajectory’. More entertainingly, he has partnered with Nicolas Mahut in doubles, and their matches have so far produced the best tennis of the tournament. 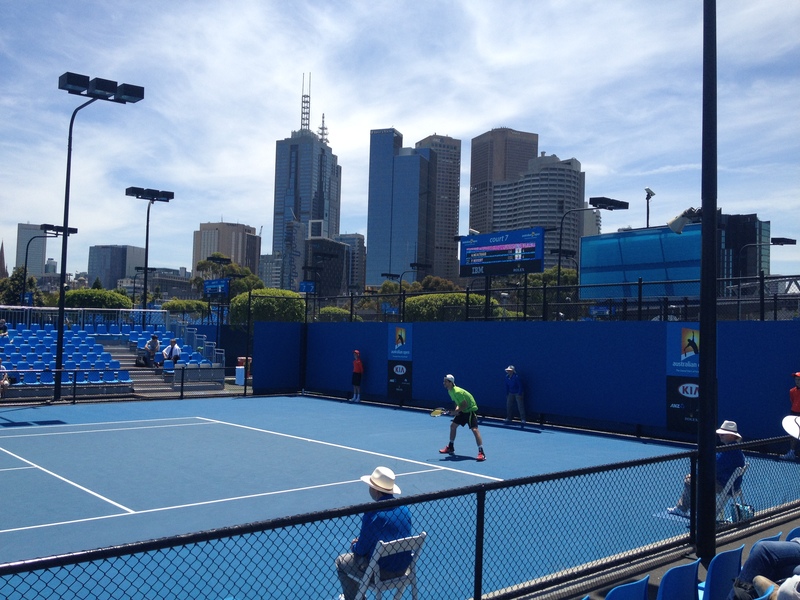 Yesterday’s victory over Grigor Dimitrov and Jeremy Chardy, secured 11-9 in the match tiebreak, was great fun. 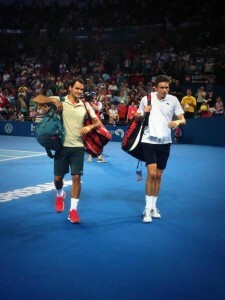 The dream final, from the perspective of the Brisbane organisers, the official broadcaster, and locals who’ve secured tickets, would be for Federer to face Lleyton Hewitt, who today pushed through to the semifinal with a comfortable victory over Marius Copil. Word is that the Australian hardcourts are considerably faster this year than they’ve been in a long time, with the speed of Pat Rafter Arena more in line with the kind of court Pat Rafter once thrived on. Rafter himself, interviewed courtside, suggested that Federer will enjoy himself this year. He also admitted that it’s still weird to enter an arena with your own name on it. (Having just renamed my house the Jesse Pentecost Coliseum, I can sympathise.) Australians are still encouraged to believe Hewitt is a legitimate contender for major tournaments, based on the fact that he was a top player a decade ago, and always tries very hard. , As I say, the culture of winning dies hard. The exception comes when he faces Federer, who has instilled in the Australian public by rote the knowledge that some battles just cannot be won, no matter how hard you try. Hewitt will next face Kei Nishikori, who beat Marin Cilic. Federer will play Chardy, who beat Sam Groth. † Apparently Novak Djokovic won Abu Dhabi, defeating David Ferrer.